Creating Effective Partnerships for School Improvement places the school within the community which is composed of a number of key players, including school leaders, classroom teachers, private foundations, higher education institutions, business and community based organizations, and government agencies. This book encourages leaders to embrace this broader community of stakeholders and to focus on the often overlooked and underutilized college and university partnerships. Grounded in case study analysis of innovative programs and practices, this book explores research-based strategies for educational leaders to implement in order to develop and sustain effective partnerships. 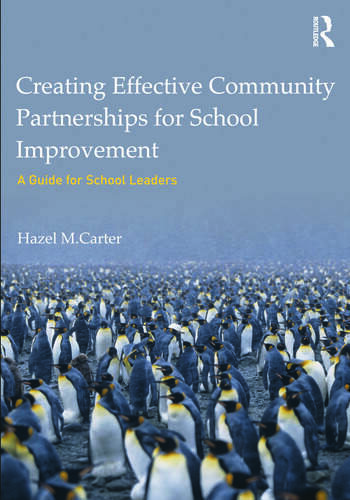 Creating Effective Partnerships for School Improvement is an important text for aspiring and practicing administrators interested in creating effective partnerships for school improvement. Reflective exercises and portfolio building activities help aspiring and practicing leaders make on-the-ground connections. Learning objectives, key terms, and additional resources further engage readers with the chapter content. Extensive appendices with sample activities, evaluation plans, meeting agendas, promotional materials, and budgets provide additional support to leaders. Alignment to the Educational Leadership Constituent Council (ELCC) Standards. Hazel M. Carter is Associate Professor of Educational Leadership and Chair, Department of Educational Leadership and Special Education at the City College of New York, USA.